Powerful, rich, and very structured and layered, this has a wonderfully pure fruit and the highest tannins since the stunning 1992 vintage. One of California s classic Cabernets. The Wine Advocate - "Inky colored, the sensational 2012 Monte Bello comes all from the Santa Cruz Mountains and is a blend of 64% Cabernet Sauvignon, 22% Merlot, 8% Cabernet Franc and 6% Petit Verdot. It's backwards and tight, with classic black cherry, crushed violets, cassis, espresso roast and crÃƒÆ’Ã‚Â¨me brulee notes all flowing seamlessly to a full-bodied, concentrated, structured and layered Bordeaux blend that has bright acidity, a stacked mid-palate and firm tannin. It needs 5-6 years of cellaring and will hold for two decades beyond that. 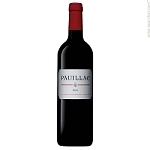 Rating: 94+"
Wine Spectator - "Beautifully structured, with firm acidity and tannins that show grip amid a core of dense currant and blackberry fruit, turning juicy. This is classic old-school Cabernet. Cellaring for five to seven years is the right approach. Cabernet Sauvignon, Merlot, Cabernet Franc and Petit Verdot. Best from 2020 through 2035." 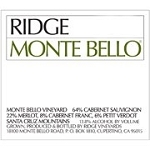 Connoisseurs' Guide - "Over the years, Ridge s Monte Bello bottlings have been among the most individual and distinctive of the stateÃ¢€â„¢s top Cabernets, and the latest incarnation fits the classic winery model of precision, restraint and varietal purity. It backs well away from high ripeness and bluster and fixes on steady cassis- and cherry-like fruit with subtle accents of oak and herbs scattered throughout its considerable length, but it is its sense of structure and keen balance that earns it a place with the high achievers of the 2012 class.